How Does EyLamo Virus Infiltrate the System? EyLamo Virus can be distributed using the most popular strategies that are typical to the Hidden Tear malware. One of them is the use of social engineering messages with email. The hackers use templates that contain text and graphics that pose as legitimate companies or institutions. The hackers aim to persuade the hackers into infecting themselves by attaching the EyLamo virus as attachments or hyperlinks to hacker-controlled sites. The criminals may make download sites that pretend to be official sources. They can host the EyLamo virus directly or contain infected payloads. They may be either office documents or bundled software installers. When the users interact with them the ransomware is delivered to the system. Browser hijackers and other types of web redirects like ad networks may also deliver the EyLamo ransomware. EyLamo Virus is a one of the newest ransomware that it based on the Hidden Tear malware family. This is one of the most popular virus projects in the last few years and its popularity has not diminished ever since its first iteration. An unknown hacker or criminal collective has taken the base source code and modified it to produce the EyLamo virus. The EyLamo ransomware follows the usual behavior strains as any other virus based on the open-source project code. The captured samples associated with it start the encryption engine upon infection. It seeks to encrypt system and user data based ona predefined list of target file type extensions. The hackers can customize the compromised files based on the targets and the attack campaign, this is a popular strategy that is often utilized by computer criminals when organizing their attacks. Oops, your files have been blocked! Please read the READ_IT.txt file on your desktop for more information. Your personal files have been ecrypted. 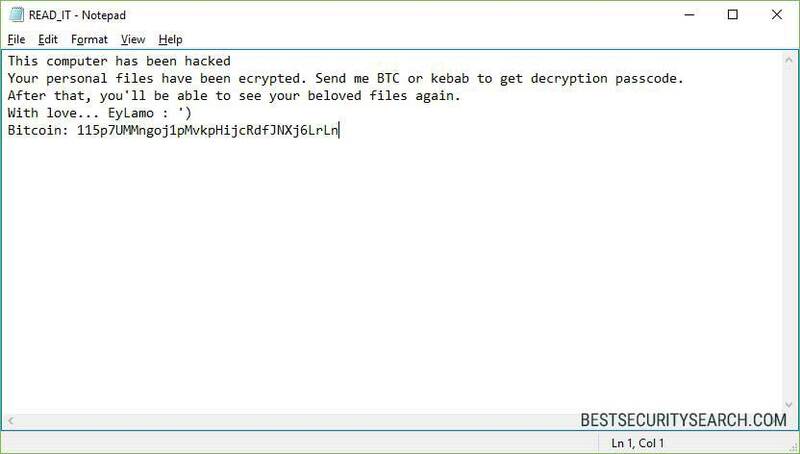 Send me BTC or kebab to get decryption passcode. All affected data is marked with the .lamo extension. During the initial investigation it has been revealed that the sum of 0.5 Bitcoins is being extorted from the victims. This is the equivalent of about 1200 US Dollars at the current exchange rate. Computer users can eliminate the active threats by following our complete removal guide. The EyLamo virus can be removed with a quality anti-spyware solution. The affected files can be restored by using a professional grade data recovery software. WARNING! Manual removal of EyLamo Virus requires being familiar with system files and registries. Removing important data accidentally can lead to permanent system damage. If you don’t feel comfortable with manual instructions, download a powerful anti-malware tool that will scan your system for malware and clean it safely for you. WARNING! All files and objects associated with EyLamo Virus should be removed from the infected PC before any data recovery attempts. Otherwise the virus may encrypt restored files. Furthermore, a backup of all encrypted files stored on external media is highly recommendable.